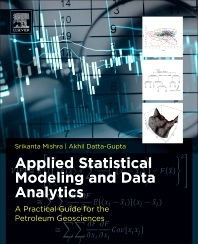 Dr. Srikanta Mishra is Institute Fellow and Chief Scientist (Energy) at Battelle Memorial Institute, where he leads computational modeling and data analytics activities for geologic carbon storage, shale gas and oil development, and improved oil recovery projects. He joined Battelle in 2010 after a distinguished 20+ year career in geosystems consulting and applied research, including an appointment as adjunct professor of Petroleum Engineering at the University of Texas at Austin. He holds a PhD degree from Stanford University, an MS degree from University of Texas and a BTech degree from Indian School of Mines – all in petroleum engineering. Drs. Mishra and Datta-Gupta have published extensively on the topics covered in this book, and have taught short courses at professional society meetings and client locations all over the world. Dr. Akhil Datta-Gupta is Regents Professor, University Distinguished Professor, and Peterson ‘36 Chair in petroleum engineering at Texas A&M University. He directs the “Model Calibration and Efficient Reservoir Imaging” Joint Industry Project carrying out research on statistical modeling, multiphase flow simulation and inverse modeling of reservoir data. Dr. Datta-Gupta joined Texas A&M in 1994 after a brief industry career and was elected to the US National Academy of Engineering in 2012. He holds PhD and MS degrees from University of Texas and a BTech degree from Indian School of Mines – all in petroleum engineering. Drs. Mishra and Datta-Gupta have published extensively on the topics covered in this book, and have taught short courses at professional society meetings and client locations all over the world.